I just finished reading Lisa See’s new book, The Tea Girl of Hummingbird Lane. More accurately, I just finished listening to this wonderful book. I often listen to books while I commute into work, and the narrators of this particular novel are great! Lisa See is a very talented author, and her stories transport me to other times, places and cultures. This particular novel centers around tea and the Akah ethnic minority living in the Yunnan province of China. After finishing this novel, I was inspired to develop a cookie using matcha (green tea) powder. Whisk together the flour, matcha powder and salt, set aside. Add the flour mixture slowly. Divide the dough into 2 parts. Roll each half into a log about 1 ¾ inches wide. Wrap each log in parchment or wax paper. Chill until firm. Slice about 1/3 inch thick. Place on parchment lined baking sheets about 1 inch apart. When cookies are completely cool, whisk together the powdered sugar and lemon juice to make a glaze. BAKER’s NOTE: These are very delicately flavored- for a more robust matcha flavor, use up to 3 TBS in the recipe. 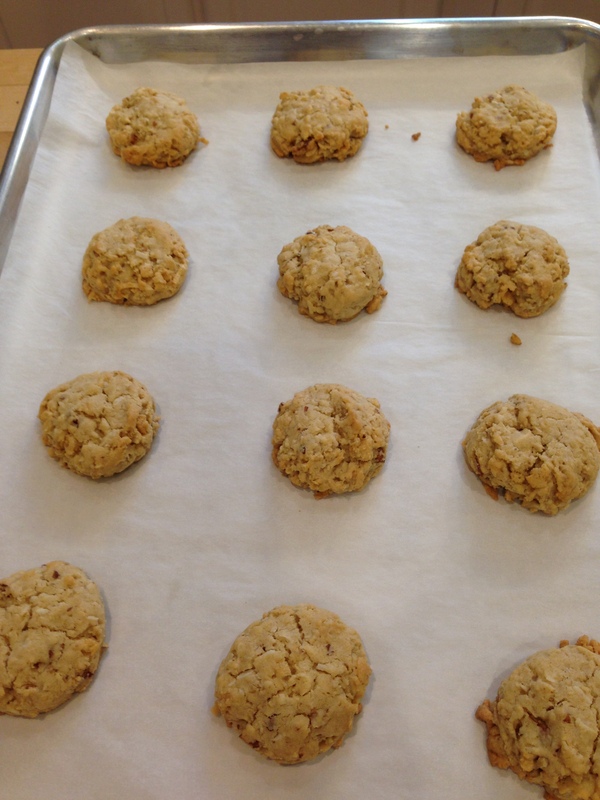 One of the more fun cookies I developed at Provisons Bake Shop was what we dubbed “Chunky Monkey”. It speaks to comfort flavors- peanut butter, chocolate and banana, all delicious on their own but when combined they are definitely more than their individual parts! The high school senior working at the counter couldn’t get enough of them- she’d even come in on her days off to stock up! Whisk together flour, oats, salt and baking soda. Set aside. Thoroughly cream together the butter, sugars and peanut butter. Add egg and vanilla. Mix until combined. Add mashed banana, mix in lightly. Add peanuts and chocolate chips. Scoop onto parchment lined baking sheets. With wet fingertips lightly press down the dough. Bake 10 minutes, rotate pans. If cookies are puffing up too much, gently bang pans to let out air. Bake another 5 minutes until firm to the touch. 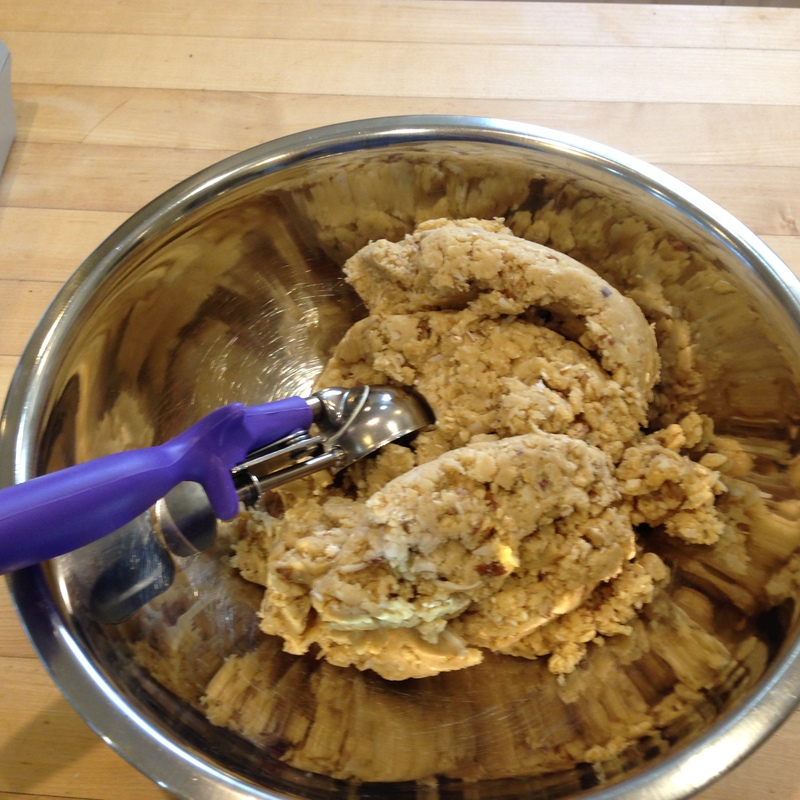 Yield 3 dozen cookies using a 1 ½ tablespoon size scoop. A couple of weeks ago, I wrote about my great experiences at bakeries in Portland, Maine. Two things that I sampled at Tandem Bakery Company have lingered in my brain and palate. So, I tried my hand at recreating them and I’m happy to report that they were successful attempts. The first one that I’ll share with you is a black sesame and banana tea bread. Black sesame seeds are rich in vital nutrients- iron, calcium, magnesium and zinc. They impart a nice nuttiness and a crunch to the banana bread. If you’re game to try something new- give this a whirl! I think you’ll be pleased. In a large bowl, whisk dry ingredients together. In a medium bowl, whisk wet ingredients. Pour into prepared pan – only 2/3 full. Bake 55 – 70 minutes until a tester comes clean. The time is a function of how much banana you use. If browning too much, lightly cover with tin foil. Cool on a rack for 15 minutes, unmold the bread and cool completely before slicing. My Uncle Herb’s sister, Edith, was another wonderful baker that inspired me. She always came to family functions with some sort of great sweet in tow. She called these buttery, delicious cookies “Slap” cookies, because she just slapped them together! Give them a try- they are simple to prepare. This recipe makes a good size batch. The cookies have a long shelf life and they freeze beautifully as well. Heat oven to 350; Line cookie sheets with parchment. Whisk the flour and salt together; set aside. With an electric mixer, cream the butter and sugar together until fluffy. Add the egg yolk and vanilla extract; mix until combined. Add the flour and salt mixture and mix on low speed until dough comes together. Scoop the dough onto the prepared baking sheets with a 1” scoop. 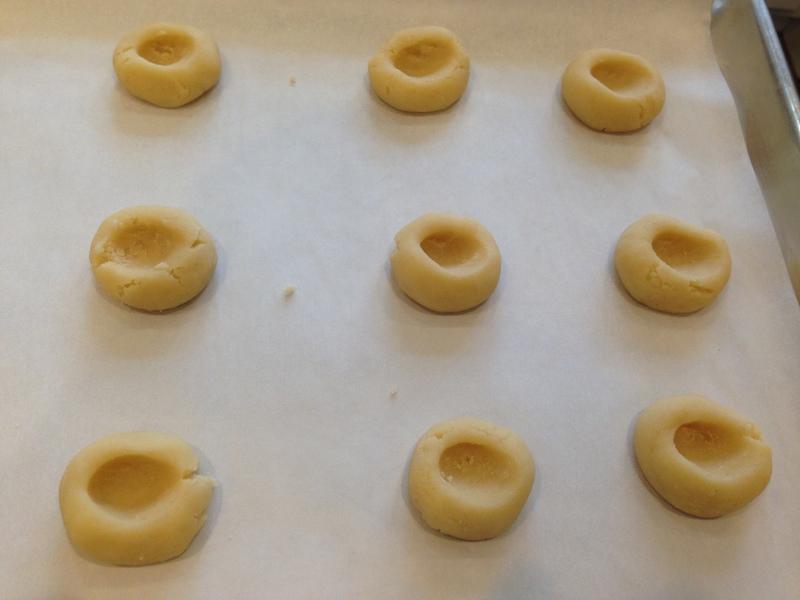 With your finger tip, make an indentation in each ball of dough. 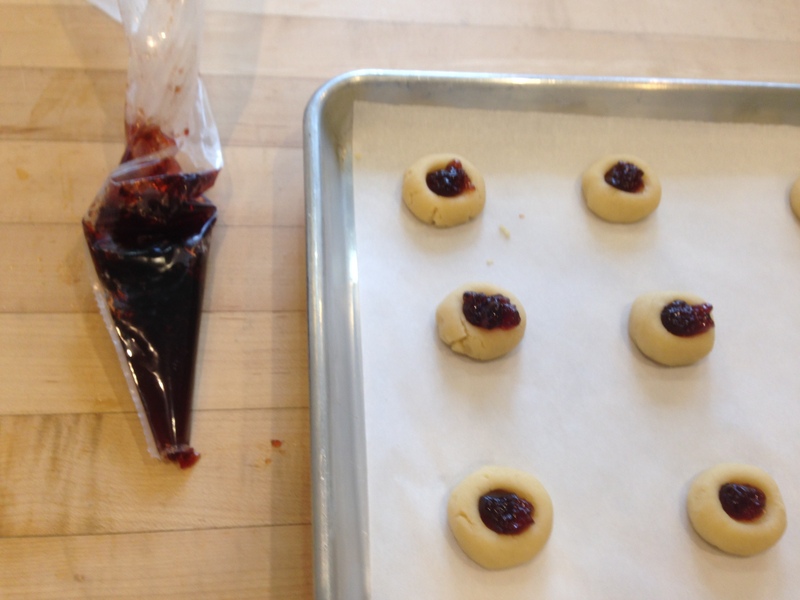 Fill the indentations with red currant jelly. A pastry bag or a Ziploc bag with the edge trimmed off works very well for this. Bake for about 15-18 minutes until light golden.